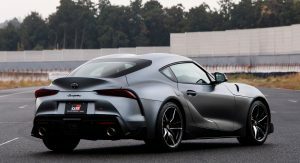 The new Toyota Supra is finally here, with the car maker revealing all the details after years of speculations and weeks of leaked images. 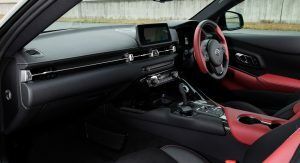 And while the rest of the world is getting the new Toyota Supra with a six-cylinder engine only, JDM customers are getting two extra four-cylinder options in the menu. 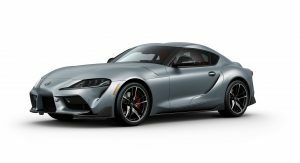 The base JDM version of the Toyota Supra is the SZ, powered by a turbocharged 2.0-liter four-cylinder unit with 194hp (197PS) and 236lb-ft (320Nm) of torque. 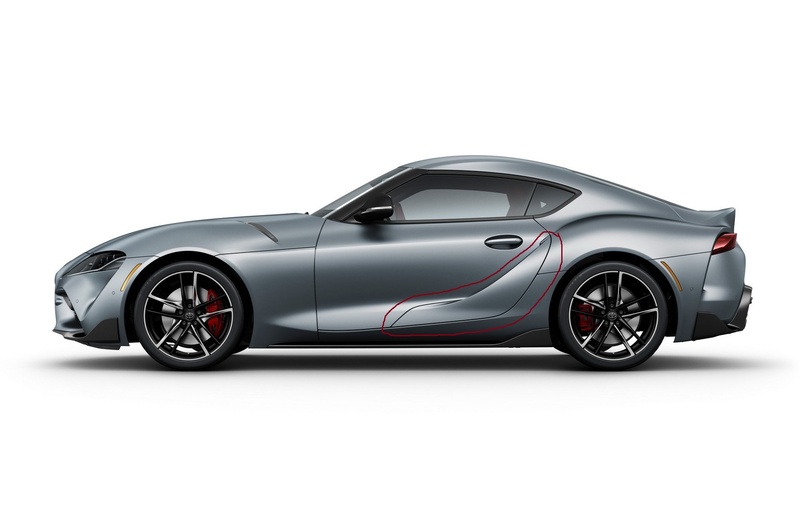 Toyota claims a 0-62mph (100km/h) in 6.5 seconds for the Supra SZ. Toyota says the base SZ “allows for a brisk driving sensation from in-town to highway”. 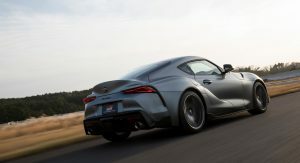 The other four-cylinder Supra is the SZ-R, which offers 254hp (258PS) and 295lb-ft (400Nm) of torque, making it capable of a 0-62mph (100km/h) in 5.2 seconds. 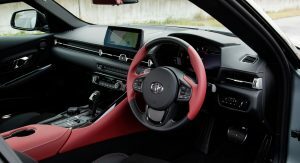 According to Toyota, the mid-range JDM Supra “is ideal for light, sporty driving”. 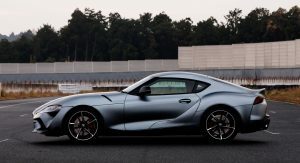 Both four-cylinder versions of the Supra are paired with an eight-speed automatic transmission, making it sort-of official that Toyota won’t offer it with a manual, at least not for now fingers crossed. The 194hp Supra SZ comes with a curb weight of 1,410kg (3,108lbs) while the 254hp Supra SZ-R sits at 1,450kg (3,196lbs). These figures are official calculations. 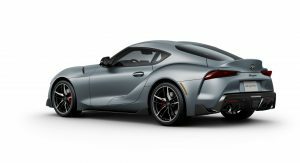 The JDM range of the new Toyota Supra is of course topped by the turbocharged 3.0-liter straight-six RZ version. 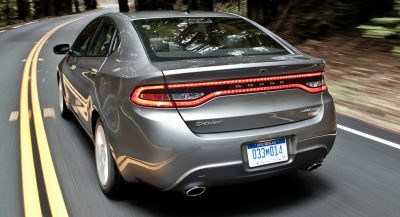 Power is rated at 335hp (340PS) and 368lb-ft (500Nm) of torque. 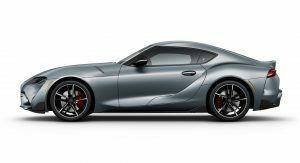 Paired also to an eight-speed automatic transmission, Japan’s range-topping Supra is capable of a 0-62mph (100km/h) in 4.3 seconds. 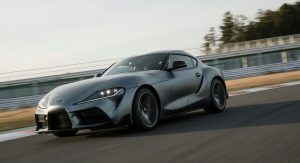 Sales of the new Toyota Supra in Japan are slated to start this spring as the first global model of Toyota Gazoo Racing’s GR series. 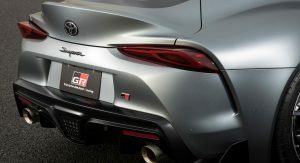 Is the new 194hp version of the Toyota Supra going to kill the GT86 / 86? 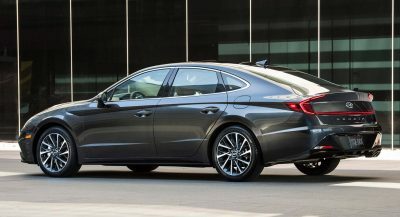 whats with the side profile, short wheelbase and overly long overhangs? especially at the front. looks weird tbh. Same design as the concept yet they managed to kill the aggression in it. 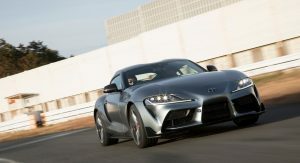 I wish Toyota would have named this car anything but Supra. .
Supra Z4, or TMW Supra – Toyatische Motoren Werke Supra. Is it OK ? Frankenstein child of a BMW Z4 & Mazda RX7. This is not a Supra! The designer & marketing team should be forced seppuku! 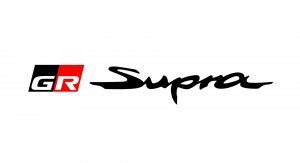 This car doesn’t deserve the Supra name. And please redesign the front bumper, that’s too much. So where’s the mention of the M-based Supra Gazoo Racing super duper version with the M2 competition’s engine? I hope the 2.0 litre versions eventually reach Europe. 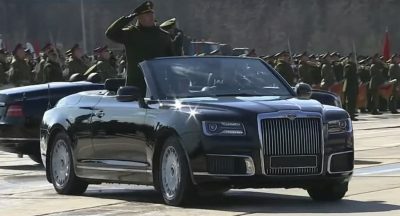 This car looks very strange to me. 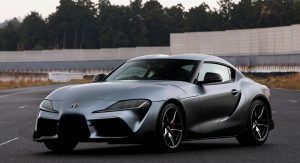 I want to like it because I always liked the Supra but this thing just doesn’t look good from almost any angle, in my opinion. I am sure some my like it but considering the market for two seater sports cars is shrinking and how this looks, I can see very low sales numbers in its future. Seems like Mazda is one of the few Japanese manufactures who can still design cars. They should be announcing more powerful versions, not less powerful ones lol. 335hp for the top version is laughable. Obviously, you do not know German engines are way UNDERrated. Toyota should’ve gotten the 4 cylinder from Subaru. It’s got more power than the V6 variant. Boom there it is. What a beauti. Boom there its is, relegated to a picture on my desktop cause i need my kidneys. 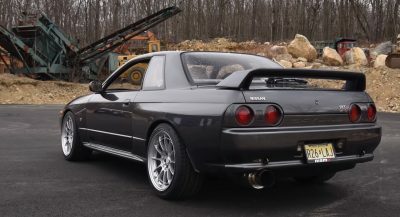 Dreams, just like being a kid a gain just the car is attainable if i was single , stayed with my mom still and bought it. You are just poor. Now, pour me some whine. ………………………..and who is the manufacturer of the 4-cyl engine, may I ask ? It’s those Germans from Munich, obviously. 90’s comeback fail. I don’t feel bad for them though. Idk. 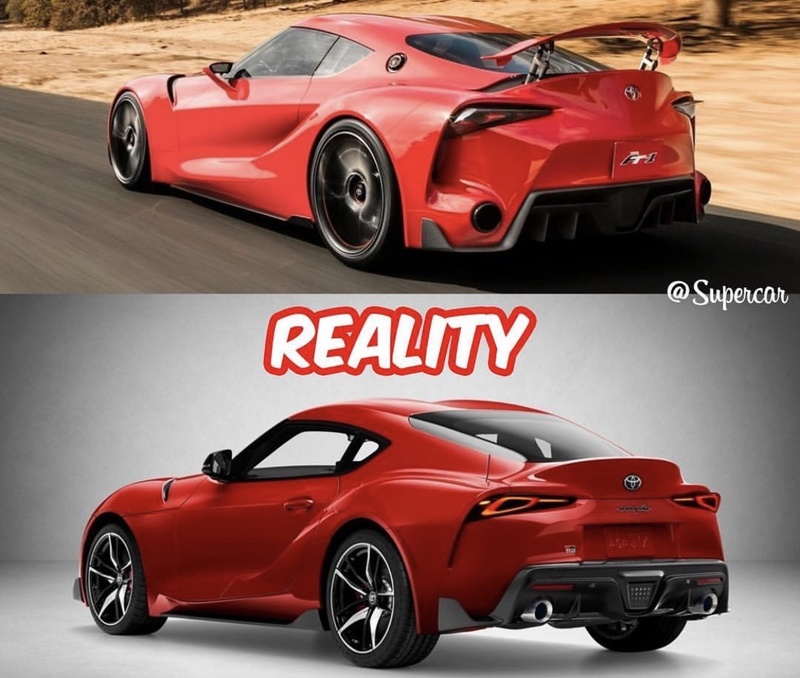 Seems to me that the new Supra is kinda ugly. It’s way too overcrowded with so many different lines and panels and whatnot. The original Supra was simple, had a fluid design while still being down-to-earth and focused on performance.